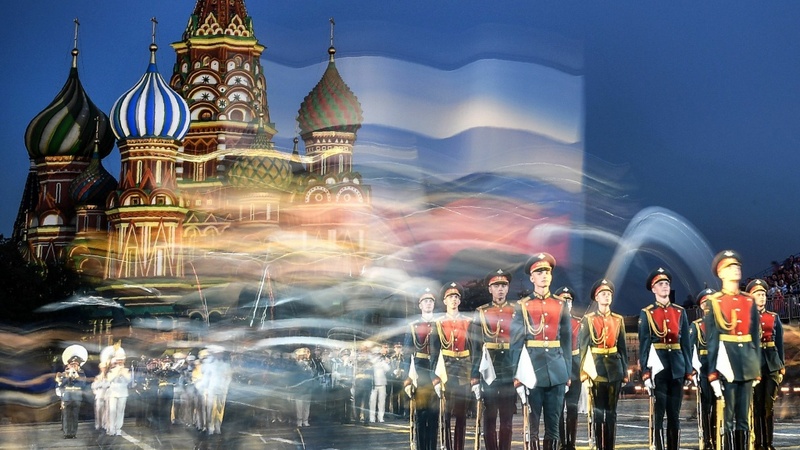 Russian honor guards perform during an international military and music festival on Moscow's Red Square in August. The U.S. government warned about the continued threat of foreign interference on Friday as it unsealed a new criminal complaint against a Russian woman described as the paymistress for Moscow's program of information war — a scheme targeting next month's midterm elections in the U.S.
Elena Khusyaynova has worked since 2014 as a top money manager for what the Russian government calls "Project Lakhta," according to charging documents. She was charged with one count of conspiring to defraud the United States; prosecutors say she handled budgets and payments associated with the disinformation schemes. Khusyaynova administered the finances for "social media operations, web content, advertising campaigns, infrastructure, salaries, travel, office rent, furniture and supplies, and the registration of legal entities" that were part of the scheme, according to court documents. Russia's active measures scheme has a budget of tens of millions of dollars, and the funding came through a company controlled by a close associate of Russian President Vladimir Putin, prosecutors say. That man, oligarch Yevgeny Prigozhin, has already been charged in another indictment unsealed by the Justice Department. Attorneys for his company, Concord, are fighting the case against it in federal court in Washington. Khusyaynova was charged in a criminal complaint in the Eastern District of Virginia on Friday. She, like the other Russians who have been charged in separate federal criminal cases, is not expected to stand trial in the United States. The government has chosen to use legal documents to lay out the case against the people who attacked the 2016 presidential election and have kept up a war of disinformation against the West. The court documents unsealed on Friday make clear that influence operations by Khusyaynova and her associates continue to this day; the criminal complaint details how she requested and managed funds from Concord through at least July 2018. Speaking to journalists Friday, President Trump said that his administration has "done a lot to protect the elections coming up very shortly." Trump also slammed his predecessor in the Oval Office for not doing enough to stop Russian interference in the 2016 election and the president once again said there had been no collusion between Russia and his campaign. Separately, the Office of the Director of National Intelligence and other top intelligence agencies said on Friday that foreign interference continues to threaten the information environment inside the United States. Election infrastructure itself — voter registration databases, ballot counting systems and so forth — appears safe for now, the agencies said, despite some ongoing cyberattacks. The biggest danger is from public messaging. "We are concerned about ongoing campaigns by Russia, China and other foreign actors, including Iran, to undermine confidence in democratic institutions and influence public sentiment and government policies," the agencies said. "These activities also may seek to influence voter perceptions and decision making in the 2018 and 2020 U.S. elections." More than two dozen Russians now have been charged in connection with the active measures, including in two major indictments from the office of special counsel Robert Mueller. They include people who worked for the "Internet Research Agency" and conducted a campaign of social media agitation — one for which Khusyaynova allegedly was a comptroller. Others charged were a group of intelligence officers in the military GRU spy agency, charged with the cyberattacks against the Democratic National Committee and other targets in 2016. The attackers stole emails and other material and released it publicly to embarrass their victims. The court documents unsealed on Friday make clear that Russian influence operations are continuing; the criminal complaint details how Khusyaynova requested and managed funds from Concord through at least July 2018. Influence-mongers used social media and other online platforms to "inflame passions on a wide variety of topics, including immigration, gun control and the 2nd Amendment, the Confederate flag, race relations, LGBT issues, the women's march and the NFL national anthem debate," according to the court papers. The Russians also seized on specific events including shootings in Charleston, S.C., and Las Vegas; the white nationalist rally and counterprotests in Charlottesville, Va.; police shootings of black men; "as well as the personnel and policy decision of the current U.S. administration." Khusyaynova and other influence-mongers discussed specific tips for targeting American populations online. When posing as liberals, they were directed not to link to Breitbart. When posing as conservatives, they were directed not to link to The Washington Post or BuzzFeed. Gay and lesbian users on the Internet "are often active at night," operatives were told. Conservatives "can view your re-post when they wake up in the morning if you post it before you leave in the evening St. Petersburg time." The Russians discussed specific ways to characterize individual American political figures: The late Sen. John McCain, R-Ariz., was to be "an old geezer who has lost it." House Speaker Paul Ryan, R-Wis., was to be "a complete and absolute nobody incapable of any decisiveness." Workers were urged to post in support of his Democratic opponent. The workers of Project Lakhta also were mindful of the ongoing investigation into whether Donald Trump's presidential campaign might have been connected with Russia's active measures. At one point, the Russians used a fake Facebook account to post a meme with a photo of former President Barack Obama with the legend: "If only media had been as bothered by Obama's ties to the Muslim Brotherhood as they are by Trump's fake ties to Russia." All along, one of the most consistent threads of the Russian influence campaign has been to pit black and other nonwhite Americans against each other. And in March, the Russians used a Twitter account to complain about the coverage of the then-ongoing serial bombings in Austin, Texas. Why weren't the bombings getting more coverage at the time, the accounts asked? Because "all of the victims have been black and Hispanic."